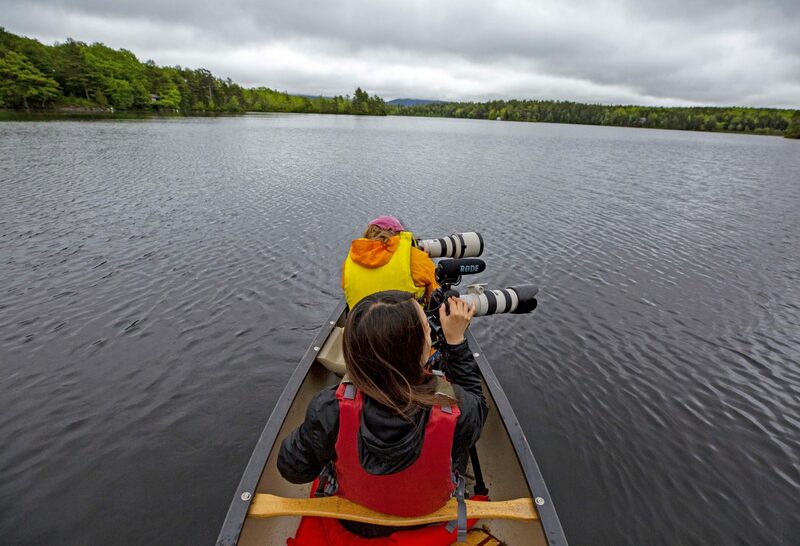 ACADIA NAT’L PARK —Canon U.S.A. is helping Friends of Acadia (FOA) protect the park and provide resources to assist in the training of a new generation of young photojournalists who are sharing the wonders of Acadia with the wider world. Canon U.S.A.’s donation, which includes cameras and other optical equipment, will be used by FOA’s Acadia Youth Technology Team (AYTT) and by the FOA’s communications department. This will allow the continued operation of sophisticated water-quality monitoring equipment on Jordan Pond and wetland restoration and monitoring at Sieur de Monts Spring. It will also support invasive species surveys, monitoring, and removal throughout the park. Water monitoring on Jordan Pond is supported by the NexSens CB-400S data buoy. This solar-powered unit sends data from its sensors to a base station at the Jordan Pond House every 15 minutes. It tracks water quality indicators such as temperature, pH, dissolved oxygen, algae growth and more. Wetland restoration at Sieur de Monts is underway. This restoration included the removal of a septic field. In addition, a consultant has completed a preliminary wetland delineation, assessed the status of vernal pools, begun communications with permitting agencies, and begun the mapping and restoration plan development. This wetland restoration project will restore a forested wetland by planting native wetland plants and incorporating improvements to water flow through the area to reconnect the wetland hydrology to the larger watershed. For the past six years, Canon U.S.A. has donated digital camera bodies, lenses, and additional high-quality photo equipment to the photojournalist team. The team’s mission is to capture the outstanding natural beauty, ecological vitality, and distinctive cultural resources of Acadia National Park through digital photography, writing, and videography. The media produced by the team are used by the park and FOA to better communicate with, and educate, park visitors, both online and in Acadia. Last year, identification and removal of invasive species was a key element of the park’s efforts to enable native plants, and the wildlife that depend on them, to thrive. Support from FOA’s Wild Acadia partner, Canon U.S.A., helped the park’s five-person invasive plant management team survey more than 900 acres and treat 72 densely-infested sections last year. In past seasons, the photojournalist team captured more than 4,000 photos and hundreds of hours of video footage of birds, sunrises, volunteers, sunsets, camping, night skies, Schoodic and Isle au Haut attractions, special events, and iconic landscape views. Team members created and edited two short films which were featured on the Department of the Interior’s website. To learn more visit friendsofacadia.org. To find out more about Canon U.S.A.’s philanthropy and Canon equipment visit www.usa.canon.com.